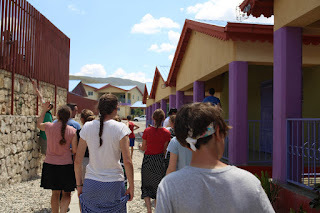 Third day in, us Minnesotans are starting to get comfortable with Haiti. We thought we had seen it all, until today. We started the day off by hopping in the Tap-Tap and starting our 45 minute journey to Titanyen. Fortunately our driver was very experienced with the roads in Haiti, and our 45 minute journey soon turned into 30. With extra time, we visited the mass grave memorial site. The mass grave site is a place where a large unknown amount of people were buried from the 2010 earthquake. 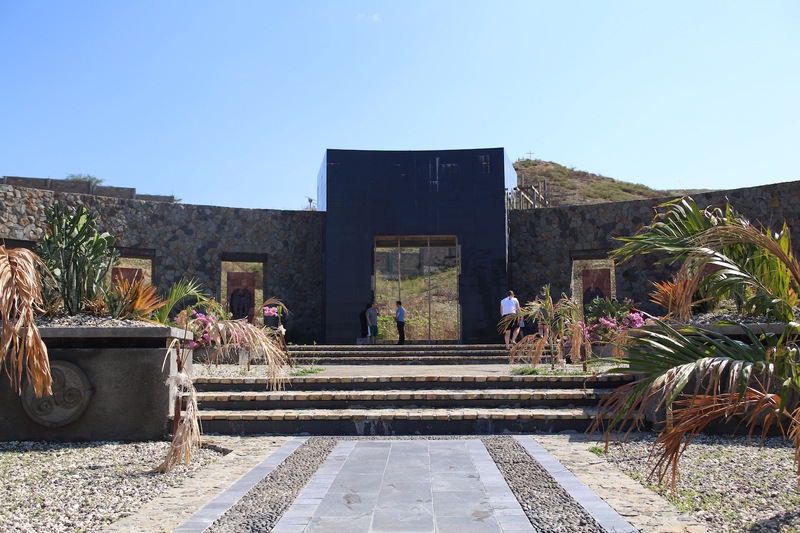 It covers a large plot of land in the mountains of Titanyen and it is a place for families to gather in remembrance of the country's huge loss. Created shortly after the earthquake in 2010, it provides closure for many families and the memorial is still being added to today. This site proved to be very emotional. After that, we experienced one of the bumpiest and craziest rides in the Tap-Tap, farther up the mountains. The road ended with Grace Village- a beautiful clinic, school, farm and orphanage. This place provides education for 360 children, and houses 48 orphans. Once we arrived, we got a tour of Grace Village. It overlooks the mountains and sea. Our first part of the tour offered something close to home. Turns out Punch Pizza, from Minnesota, donated a brick oven to teach people how to make bread and pizzas. This developed into a bakery, which is now a restaurant just down the mountain. This restaurant is named Flieri, which means "flourish" in both French and Creole. At the restaurant we enjoyed many handmade treats, and met a few recently-trained Haitian bakers. Back at Grace Village, we got a tour of the kitchen, the lunch room, and the playground. Furthermore, we got to see their garden. The garden is special because they use aquaponics. This included tubs of Tilapia fish that they use to water and fertilize the garden and feed the kids. The water that the fish live in is filled with their feces and filtered into the garden to help give nutrients to the plants. This was a major advancement that helps the village thrive. After the garden, we walked to the library of the school and the clinic. The clinic allows education and help for deeper understanding of local's health. They recently hired a OB/GYN and a dentist. They are very excited for this advancement, so they could continue to help serve more people. After arriving back to the compound, we sat down for dinner, and ate a traditional Haitian meal. This meal consisted of chicken wings, goat meatballs, plantains, rice and beans, potatoes and beets, and broccoli. Soon after, we had a family visit us from Heartline Ministries. This is an organization that helps pregnant mothers through their prenatal-care, pregnancy and first months of motherhood. The demand is so high that out of the hundreds of women that apply for help, they can only accept 33%, as of now. They typically help around 90 women at a time. The family that visited us were natives of Minnesota that felt compelled to serve the people of Haiti after the adoption of three kids. They soon moved here and decided to help with Heartline. Their main focus is providing a safe and healthy birth for Haitian women and kids. Most commonly, Haitian women give birth without any medical help in their own homes, resulting in the highest maternal and infant mortality rates in the western hemisphere. This organization has now grown considerably over the last decade or so. They wish to help more people, but a close relationship with the mothers is of the utmost importance, and it is difficult to manage the many difficulties they encounter, thus limiting their size. This talk shed some light on the process of adoption and importance of health for newborns and their mothers. 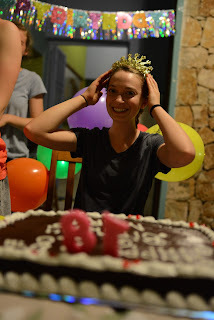 Today was a very special day, not only because of the new knowledge we gained, but it was Mary's 18th birthday. After the talk, we surprised Mary with cake, balloons, and decorations. Personally, Molly and Nora learned new things about life in Haiti, and we are very excited for our next adventures.